Just Listed :: Wonderful Peachtree Corners Townhome! Welcome home to this wonderful townhome located in the popular Greenwood community. The open floor plan, custom features, and charming character of this townhome will never go out of style. The close proximity to Peachtree Industrial Boulevard, Peachtree Parkway, and I-85 makes it convenient to and from any direction. You will love being close to many nearby restaurants and shopping spots including The Forum and Historic Downtown Norcross! · Kitchen features stainless steel appliances, granite counters, pantry, and island with breakfast bar. · The spacious living room has a cozy gas fireplace and easy access to a charming half bathroom. · The separate dining area is perfect for entertaining guests. · Master suite is a true retreat complete with a trey ceiling, large walk-in closet, and spa-like master bath with a double vanity, garden tub, and separate shower. · A lower level bedroom and full bathroom are ideal for guests or could easily be used as a home office or playroom. · The large deck is private and great for outdoor enjoyment and entertaining. 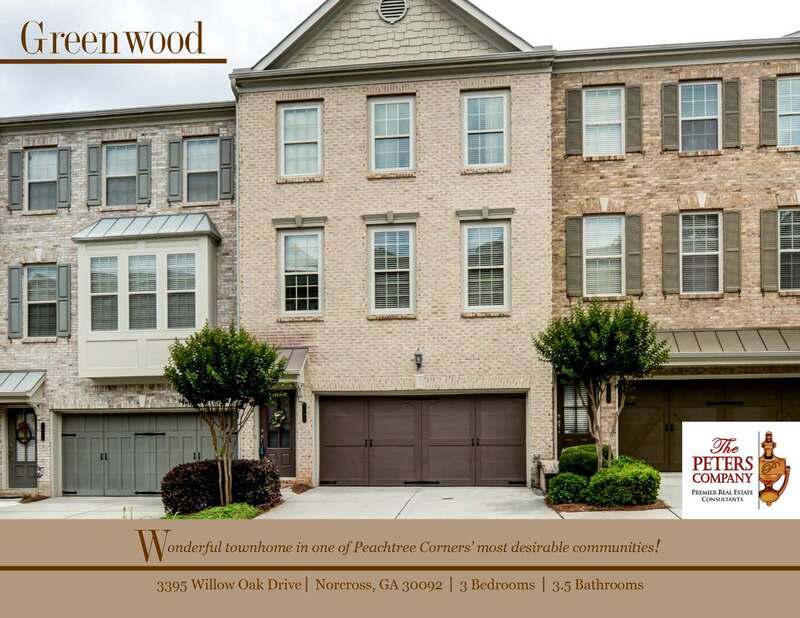 Call The Peters Company today to see this beautiful townhome at 3395 Willow Oak Drive… 404-419-3619! ← So You Wanna be a Real Estate Agent?